If you're considering extending your home, glass box extensions are a contemporary option that make a striking design statement, flood your home with light and will increase its value. 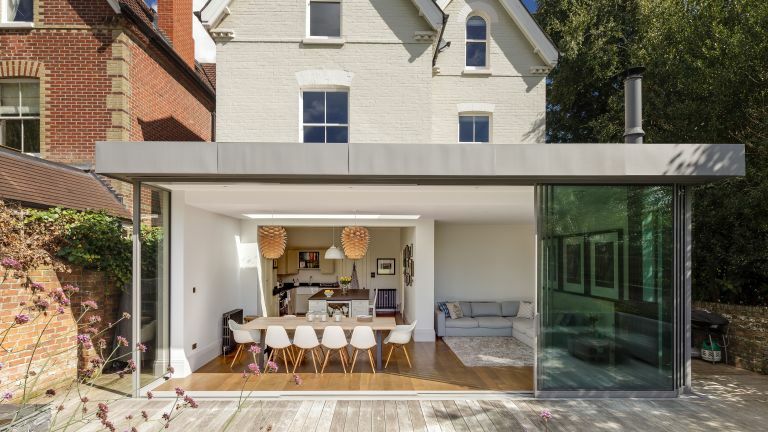 From how much you can expect to pay for a glass box extension to planning permission, design ideas and finding tradesmen to do the job, our guide to glass extensions is here to talk you through the possibilities. For more practical advice, check our guide to extending a house. How much will a glass extension cost? While we'd recommend budgeting for a minimum of £3,000 per m², you can find a more accurate estimation for your glass extension with the help of our extension cost calculator. 'While a conservatory can be a relatively inexpensive alternative to a more solid extension, a glass box extension will almost certainly be more costly,' says Alan Cronshaw from Acronym Architecture & Design. 'Planners like glass extensions to bridge connections between architectural styles or to add to a home with a very dominant existing style. Conservation officers also like the visible difference between traditional architecture and modern glass,' says Melanie Clear from Clear Architects. What are the benefits of a glass extension? 'This type of glass extension will make a real design statement. It’s hard to beat the wow factor of a substantially or totally glazed extension. It can bring glamour to any project and can also be used as a device to connect two or more solid parts of a house,' says Alan Cronshaw. Will a glass extension work on my house? 'Consider the age of the property and the type of use the glass extension will have. For example, a south-facing glass extension will receive more sun, and so risks becoming very hot inside. A north-facing extension with underfloor heating can be a nice, light addition to a property' says Melanie Clear. 'More of a problem than this can be glare and solar-gain in the summer. Even here in the UK, I have seen many such extensions where the owners have had to install blinds to offer shade,' says Hugo Tugman of Tugman Architecture & Design. Who can build a glass extension? 'Glass box extensions will usually involve specialist design detailing. So while you and your architectural designer may produce the layout and elevations for a glass extension, you’ll need to find a designer, manufacturer or contractor to assist with details such as door systems and glazed walls,' says Real Home property expert Michael Holmes. 'The degree of specialism will depend on what you want to achieve: a structure made entirely of glass, including load-bearing structural glass beams and columns, is very specialist, and there are only a handful of companies that produce this kind of work. 'Although the major element of your extension is glass, there are still plenty of design options. The expanses of glass will probably sit in some kind of frame, and it is likely that you will want this to be as thin in profile as possible. Powder-coated aluminium is often chosen where the paint colour is applied in the factory, giving a wide range of shades. The glazing can have different coatings that will affect the look of the glass extension, from transparent to reflective,' say Alan Cronshaw. 'Whether the glazed panels are fixed, bi-fold, or slide open, will also have an impact on the frames and how the completed glass extension appears. For inspiration, go to our glass extension design ideas gallery. 'While glass can be hard and strong in certain directions, it is rigid, brittle, heavy and unforgiving to movement. This makes it more difficult to install than most other building materials,' says Hugo Tugman.